My parents have a gorgeous rosemary plant that just keeps growing and growing. They are forever hacking away at it because it’s just too huge. I was always under the impression that rosemary was easy to grow, yet I’ve attempted to grow rosemary several times with no success. The really funny thing about my parents’ rosemary plant is that it’s in the koi pond. Rosemary is supposedly happy in warm, dry, sunny, areas. And I’ve managed to drown at least one rosemary. So I am a bit baffled as to their success. Nevertheless, I purchased a rosemary start (again) and I’m determine that it will live this year. You would think I would be able to get it to live! After all, it is supposed to be easy to grow. 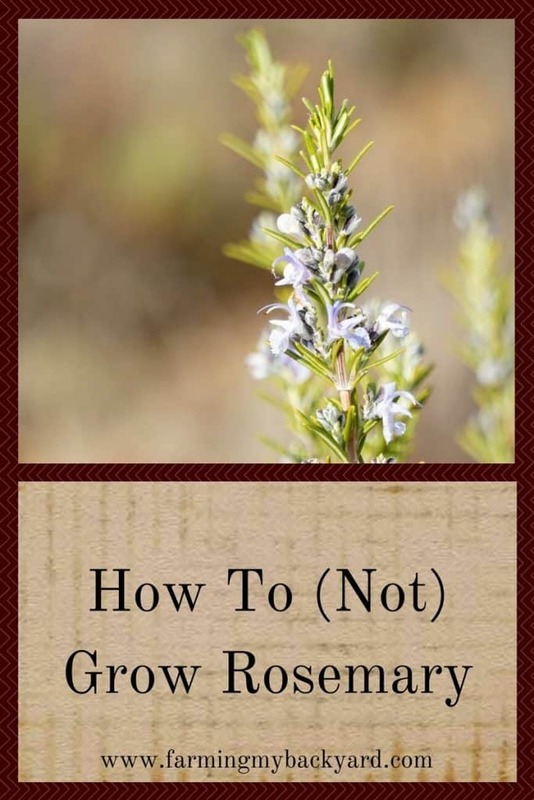 The Herbal Academy even lists rosemary as one of 5 easy to grow herbs. It will go in the front yard herb garden. It’s protected from rambunctious chicken scratching out there. It’s sunny. It’s as warm as it gets here. It IS however slightly acidic, so I’ll need to amend the hole with wood ash, something I didn’t try the last few times. Also, my front yard soil needs more amendments, so I’ll have to make sure the hole is nice and deep and backfill with nice fluffy compost. Then the trick is not to overwater. I have this really bad habit of forgetting to water and then drowning all my poor dried out plants. This time it WILL live! One of these days I’ll get my rosemary to be happy and thriving, and then it will be time for some awesome rosemary sourdough crackers. Until then, I’ll just keep trying to conquer this black thumb. Any other great rosemary growing tips out there? Argh, chickens really make such quick work of our gardens, don’t they! Thanks! I really enjoy the link ups! Just wanted to say that here in E. Texas we have quite acidic soil and I make no amendments other than yearly compost, and all of my rosemary plants are HUGE. I kind of just ‘set it and forget it’, and it seems to do fine. When I plant it, it is usually in the cooler months (it gets deathly hot/dry here), and I do have to water it maybe 2-3 times a week initially for a few weeks (if we receive no rain at all) to make sure that the roots do not completely dry out. When the needles get that ‘blue’ look, or when the tips look like a shepherd’s crook, it’s time to water. The other thing that I think it loves is that our soil is almost straight sand here. Okay, it IS straight sand, besides the compost! So, drainage is extremely good. It’s funny; when I bought rosemary for the holidays and brought it inside, I always ended up killing it by overwatering it or completely forgetting I had it. It’s feast or famine with my houseplants. Keeping it outdoors has, so far, been extremely easy. Good luck! Oh, good to hear it does well in the acidic soil and nice and dry. I ended up planting mine with a shovelful of compost in the hole and it was quite happy until the goats got out and decided to rip it out. I replanted it and I’m still waiting to see if it will make it! I’m glad your rosemary is happy! 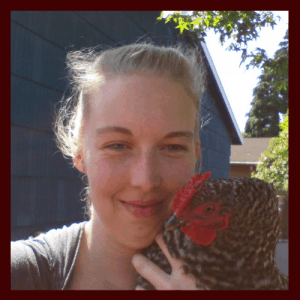 Yes, my husband is enamored of the chickens and was quite happy without the goats, but they both do a number on the plants you wish they could ignore.